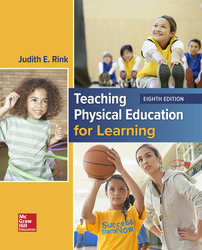 Teaching Physical Education for Learning, guides future physical education teachers in designing effective learning experiences for students grades K-12. This user-friendly text emphasizes developing students' motor skills and physical abilities through interactive teaching strategies. Physical education teachers will not only learn instructional skills, but also how to adapt their teaching to different content and student needs.